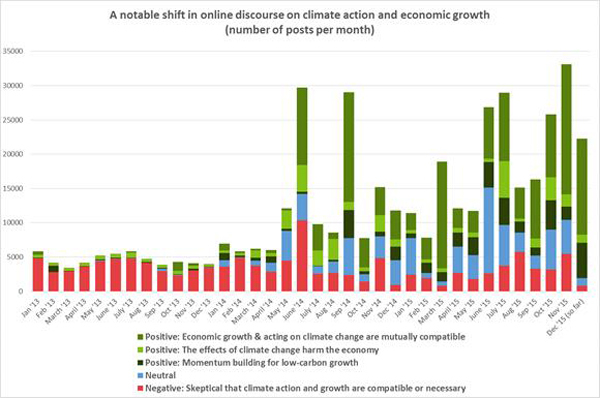 Positive discussions about the climate action and economic growth nexus on social media have increased by 700% over the past three years according to new analysis by the New Climate Economy (NCE). Using social media monitoring software, NCE conducted analysis of more than 430,000 relevant English posts on Twitter, Facebook and online forums from January 2013 until 13 December - one day after the conclusion of the Paris climate talks. Measuring key terms such as 'climate', 'environment', 'CO2', 'global warming', 'economy', 'GDP' and 'degrowth', the research found that messages in support of climate action combined with economic growth had risen by 1500%, while negative commentary on climate action decreased by 15% over the same three-year period. “The positive shift in how people are talking about climate action and economic growth is striking,” said Helen Mountford, programme director of the New Climate Economy. “From business leaders, to government policymakers around the world, to economists, to mayors, to the general public, there is a deepening understanding that climate action is not only necessary, but it can also be good for development and growth. The change in social commentary highlights how business leaders, investors and governments are beginning to grasp the intertwining relationship between climate change and economic growth. Business leaders in particular are using social media as a catalyst to promote sustainable products and brand messages. Another new report released this week from insight group Sustainly has revealed how big food brands are using the likes of Facebook and Twitter to raise awareness of their CSR efforts. The Big Brand Report studies 175 brand-owned Facebook pages from PepsiCo, Procter & Gamble, General Mills, Nestle, Mondelez, Mars, Coca Cola, Johnson & Johnson, Unilever, McDonalds, ABF, Danone, Diageo, Kimberley-Clark and Abinbev – a combine Facebook audience reach of 376 million. The report found that these brands are more likely to share news about health and wellbeing, charitable causes and sustainable sourcing than any other issue. While most companies generate ‘soft campaigning’ through promotional messages, some are going the extra mile to convey exactly how their company is making a difference. The report highlights PepsiCo’s Liter of Light campaign that saw $1 donated to an eco-lighting charity every time the #PepsiChallenge hashtag was used. Meanwhile, Ben & Jerry’s climate movement video, which visualises the two-degree temperature rise by melting ice-cream, sent a powerful, relatable message to its followers. Earlier this year, edie explored five ways that social media is now driving corporate social responsibility as companies look to portray themselves as sustainable bastions rather than those trying to turn a quick profit.